Not just tasty, but a nice executive little package too. Trader Joe’s Dukkah is a brilliant new introduction to the American food lexicon – a delicious addition to otherwise tasty bread and, more than that, a party in a jar. Dukkah, or “duqqa” as it is more commonly spelled, is an originally Egyptian side dish made, simply, from a mixture of herbs, nuts and spices for dipping bread in. Word has it that this tasty hors d’oeuvre is all but ubiquitous in Cairo and beyond. The geo-politcal climate being what it is – I’m content to take their word for it. Dukkah, takes it’s name from the Arabic word for “to pound”, taken from the simple process of making dukkah – just jamming a bunch of tasty spices and nuts together. Traditional dukkahs, as you may expect from such a folk recipe, vary widely in composition. Trader Joe’s take on it is a combination of crush almond, fennel, anise and sesame seeds, plus coriander and salt. I’m sure this may raise some more traditional dukkah lover’s eyebrows, but I couldn’t be happier with this flavorful, exotic mix. The product label is helpfully emblazoned with the instructions, “Take a hunk of crusty bread, dip it in olive oil and then in DUKKAH”, which was straightforward enough for me. I decided to engaged my jar of dukkah with a loaf of Trader Joe’s Kalamata Olive bread, figuring it was both crusty enough and small enough to fit into my cluttered, tiny kitchen. Also, hey, it’s got olives in it, so yum yum. I prepared a little dish of olive oil, opened my aromatic jar of Egyptian bread topper, and dunked the dukkah out of my bread. Was it good? Friend, it was absolutely great. Now before I get carried away with unalloyed praise, let’s get the facts straight. A nice crusty bread is damn good in it’s own right, and dunking said bread in some cold-pressed, extra virgin olive oil? You can’t really go wrong. The immediate question is how much enjoyment did the the dukkah lend to this simple banquet? The straight answer is – a great deal. 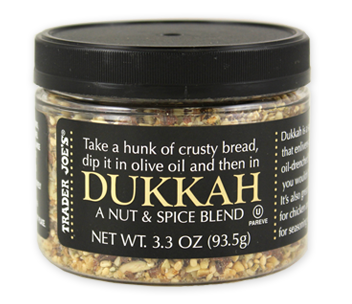 Dukkah is like having a delicious new tool in your meal tool box. Hit bread with some savory olive oil and that’s good, add to that a splash of tangy balsamic vinegar and that’s better, follow that with some nutty, crunchy, spicy dukkah and you’ve just added a whole new dimension to your meal. And while the taste is nice in and of itself, the crunch is really the selling point here, making a mouthful of sopping bread even more of a pleasure to work on. That said, this spice mixture might not be for everyone. Anise is a strong flavor, commonly identified with black licorice, and while it’s presence in Trader Joe’s Dukkah is not overwhelming it certainly in noticeable. If you’re interested in giving yourself over to an exotic taste for a new way to enjoy bread, go for the dukkah, but if you’ve never warmed up to black licorice you might consider giving it a miss. Either that, or consider whipping up your own batch. Dukkah amounts to little more than a dry mix of crushed nuts, spices and a little salt. Making your own is as easy as taking a walk down the dry goods aisle of your supermarket. Want to substitute salt and anise for rosemary and black pepper? Why not? You can find one alternate recipe here and others all across the web. Taste aside, dukkah has a lot to offer. It’s a very easy addition to the table – a casual condiment that can be dabbed in or done without as the mood dictates. It also fits easily into parties, allowing simple, tasty snacking for a whole room with just one simply jar. Of all the wonders of dukkah, most incredible is how many servings you’ll get out of this one $2.99 container. With a price that low, consider throwing one in your cart next time and forgetting about it in the cabinet until company comes over. Would I Recommend It: If you like bread and don’t hate anise, go for it. Would I Buy It Again: As soon as this jar runs out (so not for a while). Final Synopsis: Why has it taken me so long to hear of this stuff? Best coating for pork chops ever. I loe this stuff, but it’s gone from the shelves. Why???? I honestly think the problem was TJ’s marketing it (on the bottle that is) as a bread dip. I mean I’m sure it’s amazing as a bread dip too… but how often do we do that at home? MAYBE once or twice a year for a party? I used this stuff ON EVERYTHING: Salad, Pizza, Sandwiches.. Pasta.. Soup (ohhh.. so good in soup!) and if the bottle has read: “Dukka Nut & Spice Blend.. The Addictive Everything Spice Mix you’ll love on Salads Sandwiches, and much much more.” it would have been used up by consumers, and flying off the shelves. If enough was selling then they wouldn’t discontinue it. I was told at the store it was discontinued :(… Please bring it back!!! I agree! BRING IT BACK!!! ‘LL PAY TOP DOLLAR!!! I second and third and fourth…..all these responses…..please bring this back! this stuff is EPIC, especially with toasted bread with some nice extra virgin olive oil…wow…and it’s healthy too! Please bring it back – I am hooked on it!!! I wrote the company. They answered really quick. Said there wasn’t a demand. They also said if more people ask for it they might be able to bring it back. How did you go about writing the company? Do you have an email address? I’d love to write them with suggestions as to how they could massively increase demand for this product. Oh, no… what! Another of my favorite Joe products discontinued (Blueberry Tea, Beef Bacon)?!?! I was determined to look out for this and hoard as much as I could before it disappeared, NOOOO! 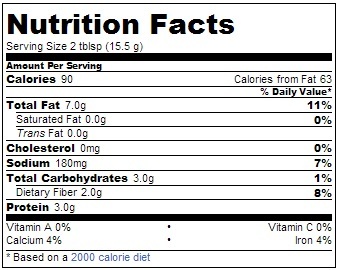 This was my favorite “nut” crust for fish, it’s so good! But I’m down to my last jar! I love Dukkah! Could not believe they discontinued it. You are all right – it is SO much more than a bread dip. We must rise up and bring it back! What can we do to let TJ’s know we’d like it back on the shelves? does anyone have a recipe for making their own? I don’t have a Penzey’s near me, but I can try and find the ingredients at whole foods or ?